Almost any meal can benefit from the goodness of nature’s most perfect fruit, the avocado. Whether you’re serving breakfast dishes at a brunch party, looking to liven up the main event, or giving dessert some panache, avocado’s creamy texture can play a starring role. And best of all, you get color and flavor, from breakfast to dinner, in every beautiful bite. Here are some of our favorite ideas to get you started. Overnight oats, smoothies and smoothie bowls all get a green transformation with the addition of avocado. Here’s a terrific Avocado and Banana Smoothie recipe that takes full advantage of the green fruit’s creamy texture, once puréed. To make this recipe vegan, swap out the plain yogurt for coconut yogurt. Either way, you’ll take your smoothie from good to great with the addition of avocado. If you prefer to eat your breakfast rather than drink it, these Heart-Healthy Avocado Banana Pancake Stacks make for a smooth batter that’s designated as heart-healthy by the American Heart Association. What’s not to love? Don’t feel like cooking but crave a next-level lunch? No problem! Try this Heart-Healthy Avocado Poke Bowl — you won’t even need a skillet! You will need to chop, though. Chopped sushi-grade ahi tuna, avocado, red peppers, a scallion, and grated carrots get marinated in an umami-rich soy, rice wine vinegar, toasted sesame seed, and red chile flake sauce before being served over a bowl of brown rice. This dish gets bonus points for being on-trend and for creating a portable meal you can take to the office. 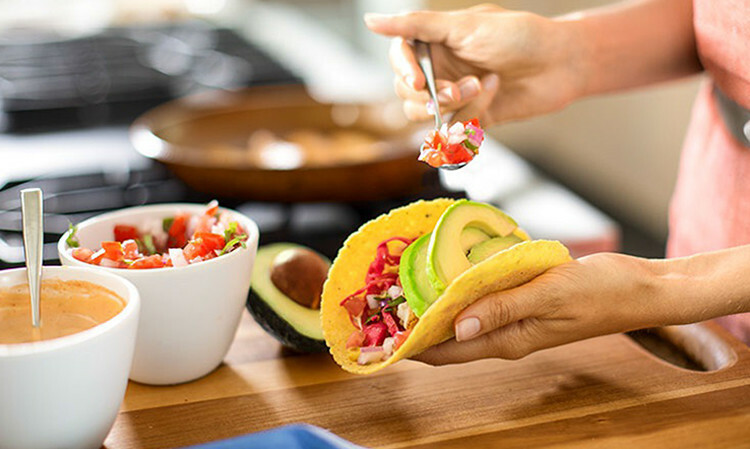 There’s no doubt that the avocado salsa in this Tequila Shrimp Tacos dish takes the humble hand-held food from fun to fabulous. It doesn’t hurt that the shrimp is finished in a good glug of tequila, but it’s the avocado salsa, with fresh jalapeño, red onion, lime juice, and zest that give the final dish enough oomph to serve at a dinner party. And since the whole dish is ready in 15 minutes, you have enough time to get dessert going without breaking a sweat! Gluten-free, rich, and decadent, these Chocolate Avocado Brownies harness the butterlike texture of avocados, making this dessert a moist, dreamy masterpiece. The addition of instant coffee powder sets the chocolate notes alight for a winning combination and, dare we say, brownie upgrade.